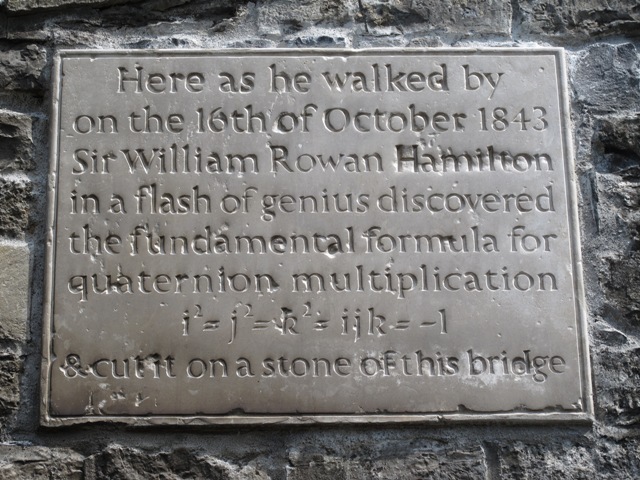 In yesterday’s post I mentioned in passing the bridge (Broom Bridge) beside which William Rowan Hamilton first wrote down the fundamental result of quaternions after having a flash of genius while walking from Dunsink Observatory into Dublin. That reminded me last night that a while ago I read a piece in Physics World (which you can read here, but only if you have a subscription) about whether breakthroughs in physics occur very often in the way of Hamilton’s – through sudden flashes of inspiration or, as they are called in the article, “light-bulb moments” – or are more often the result of solid hard graft, sweat and spadework? In other words, how much is inspiration and how much perspiration? The piece includes some interesting comments from distinguished scientists about their own “Eureka” moments, which I’m sure will resonate with many researchers, not only physicists. Incidentally, the article refers to such moments as “claritons”, a word I’d never heard before, presumably intended to evoke solitons. 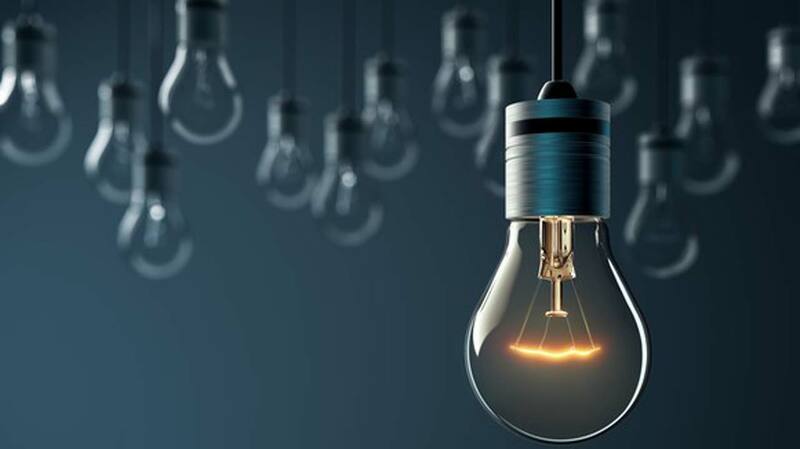 It is interestin, though just how strongly the light-bulb has become so strongly associated with this sort of brainwave. You can find a short discussion of this here. Anyway, I’m pretty sure that most scientists – even the eminent individuals interviewed for the Physics World piece – have spent a large part of their time “stuck”. I know I have, but then I’m not really eminent anyway. In the long run it’s probably good to go through such periods as I think they’re essential for intellectual development, but they’re undoubtedly extremely frustrating at the time. How you get “unstuck” is a very mysterious process. I’m not a neuroscientist, but it seems to me that when you get really immersed in, say, a research problem, your subconscious brain gets drawn into what you think is a fully conscious process, to the extent that even when you’re apparently not thinking about something you really are. I’ve had ideas come to me in all kinds of weird situations: watching ducks paddling on a pond, listening to music, walking in a park, and even pushing a trolley around a supermarket. Often it seems that it’s precisely when you’re not thinking that you have your best ideas. It’s not always clear what acted as the trigger, but and when it is it is often something quite abstract. In the case I mentioned of the ducks on the pond it was just a question of thinking about reference frames. It was a nudge in the right direction, but I still had to do quite a lot of work to finish the calculation. Come to think of it, it’s usually at that conceptual level that such things happen rather than in the detailed working, at least in my case. The Physics World piece also talks about ideas coming through dreams. That has happened to me too, but I think it’s basically the same phenomenon that I’ve just discussed. It seems to me that dreams are a product of your brain sorting through recent events or experiences and trying to make sense of them in terms of others it has filed away. This can help with a research problem by flagging up a connection with something else hidden away. I can remember at least two occasions when I’ve woken up from a dream with an exact understanding of what I’d been doing wrong and how I could fix it. It’s great to wake up in the morning with that kind of feeling! I know it’s wrong to draw inferences about other people from one’s own particular experiences, but I do feel that there are some general lessons. One is that if you are going to be successful at research you have to have a sense of determination that borders on obsession. You have to immerse yourself in it and be prepared to put long hours in. When things are going well you will be so excited that you will find it as hard to stop as it is when you’re struggling. I’m writing as a physicist, but I imagine it is the just same for other disciplines. The other, equally important, lesson to be learned is that it is essential to do other things as well as doing science. Being “stuck” on a problem is an essential part of mathematics or physics research, but sometimes battering your head against the same thing for days on end just makes it less and less likely you will crack it. The human brain is a wonderful thing, but it can get stuck in a rut. One way to avoid this happening is to have more than one thing to think about. I’ve lost count of the number of times I’ve been stuck on the last clue in a crossword, which usually means that my facility for thinking laterally, which is so essential for solving cryptic puzzles, is not operating well. What I always do in that situation is put it down and do something else for a bit. It could even be something as trivial as making a cup of tea, just as long as I don’t think about the clue at all while I’m doing it. Nearly always when I come back to it and look at it afresh I can solve it. I have a large stack of prize dictionaries to prove that this works! It can be difficult to force yourself to pause in this way. I’m sure that I’m not the only physicist who has been unable to sleep for thinking about their research. I do think however that it is essential to learn how to effect your own mental reboot. In the context of my research this involved simply turning to a different research problem, but I think the same purpose can be served in many other ways: taking a break, going for a walk, playing sport, listening to or playing music, reading poetry, doing a crossword, or even just taking time out to socialize with your friends. Time spent sitting at your desk isn’t guaranteed to be productive, and you should never feel guilty about taking a thinking break. I’d be interested to receive examples of other “light-bulb” moments through the comments box. I’d also welcome comments from neuroscientists on my extremely naïve comments about how the brain works in such situations. Well, here I am in Maynooth for the first time in 2018. I flew over from Cardiff yesterday. The flight was rather bumpy owing to the strong winds following Storm Eleanor, and it was rather chilly waiting for the bus to Maynooth from Dublin Airport; nevertheless I got to my flat safely and on time and found everything in order after the Christmas break. This morning I had to make a trip by train to Dublin city to keep an appointment at the Intreo Centre in Parnell Street, which is about 15 minutes walk from Dublin Connolly train station. I bought an Adult Day Return which costs the princely sum of €8.80. Trains, stations and track in Ireland are maintained and operated by Irish Rail (Iarnród Éireann), which is publicly owned. Just saying. The distance between Maynooth and Dublin about 25 km, which takes about 40 minutes on the local stopping train or about 25 minutes on the longer distance trains which run nonstop from Maynooth to Dublin. As it happens I took one of the fast trains this morning, which arrived on schedule, as did the return journey on a commuter train. My first experience of the Irish railway system was therefore rather positive. I had thought of having a bit of a wander around the city on my way to Parnell Street but it was raining and very cold so I headed straight there. I arrived about 20 minutes ahead of my scheduled appointment, but was seen straight away. The reason for the interview was to acquire a Personal Public Services Number (PPSN), which is the equivalent of the National Insurance Number we have in the United Kingdom. This number is needed to be registered properly on the tax and benefit system in Ireland and is the key to access a host of public services, the electoral roll, and so on. You have to present yourself in person to get a PPSN, presumably to reduce the opportunity for fraud, and I was told the interview would take 15 minutes. In fact, it only took about 5 minutes and at the end a photograph was taken to go on the ID card that is issued with the number on it. For the return trip to Maynooth I got one of the slower commuter trains, stopping at intermediate stations and running right next to the Royal Canal, which runs from Dublin for 90 miles through Counties Dublin, Kildare, Meath and Westmeath before entering County Longford, where it joins the River Shannon. One of the intermediate stations along the route next to the canal is Broombridge, the name of which stirred a distant memory. This episode is commemorated on 16th October each year by an annual Hamilton Walk. I look forward to reporting from the 2018 walk in due course! P.S. 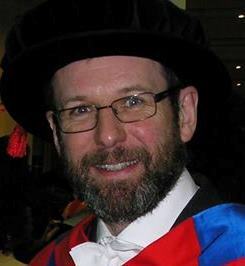 Maynooth is home to the Hamilton Institute which promotes and facilitates research links between mathematics and other fields.